The funny thing is, I actually do want to scream our news from the rooftops! We are incredibly excited to meet our newest little one, and knowing the gender has helped us connect with the bean even further. We have a name picked out, and the girls refer to their newest sibling by name already. And after we learned the gender, I found myself listening to the song Far Away by Ingrid Michaelson several times a day. I will bear three girls all with strawberry curls, little Ella and Nelly and Faye. 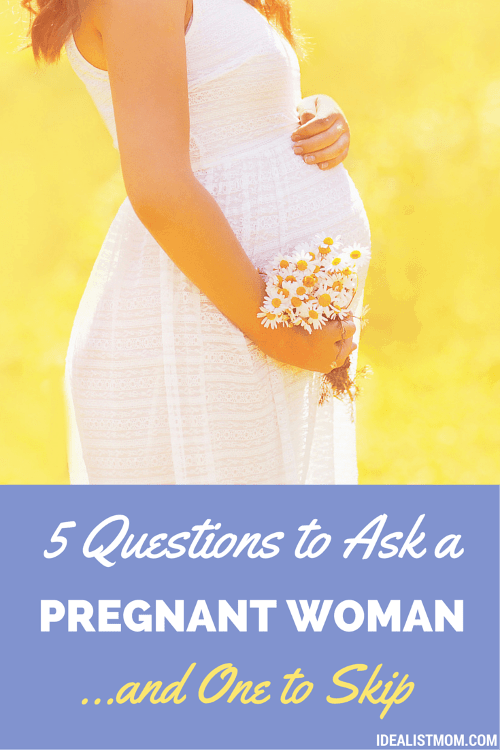 What are your best go-to questions to ask a pregnant woman? Share in a comment below! Okay, so I did not know you were 37. I am a decade younger, and with already having three kids and now being visibly pregnant, I am definitely starting to get comments. I don’t mind the gender one that much though, although it is weird the varied responses you get and that look…. Katelyn, I am officially an OLD LADY. Hehe. I bet you could tell some stories about the comments you’re getting! You make such a good point. I’ve had tricky family situations before, so I totally understand and feel kind of silly for not seeing that before I hit publish! I’ll go edit to “family or friends” above. Thank you so much for taking the time to comment! You certainly don’t look 37! And I’m so excited for you! (Though I already knew, because I think I already asked you. Oops!) You make good points. We just found out we’re pregnant with baby #3 (shh my mom doesn’t even know.) and we have 2 boys so far. I’m wanting to wait to tell people we’re pregnant till I know. I don’t want there to be a team pink and team blue. UGH! For those who asked me if I knew what I was having, I would answer (if in good spirits) “Of course! A baby!”…when I was feeling cranky, I would say something like “Kittens”. And, I was 41 when I had my first and only. I love the questions to ask instead list! Yay, congratulations!! It must be exciting to have 3 girls and see how their individual personalities shape up! Hope everything goes well with the remaining of the pregnancy! Loved the list too, will keep that in mind! I just found out I’m pregnant with our third girl as well. Since EVERYONE seemed to think it was going to be a boy, we naturally get the same platitutdes and encouragement to “try again”. To which we say “heck no”… our family is COMPLETE, regardless of our childrens’ genders! Well….I am naturally pregnant at 43 and the worst I was ever asked/said so far was….. Really? I didn’t know someone could get pregnant at 43, those eggs might be stale.